This refreshing salad pairs well with the hearty salisbury steaks and gravy. Great way to lighten up a comforting meal. In a large bowl combine the ingredients. 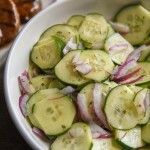 Allow the salad to sit for at least 30 minutes in the fridge so the flavors can soak up into the cucumbers.